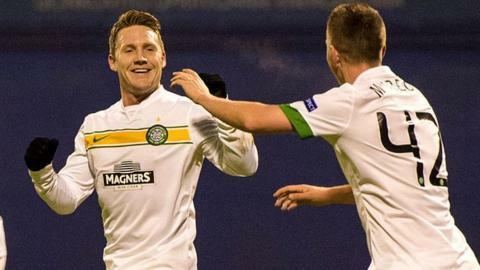 Kris Commons is refusing to sign a new contract at Celtic because he has only been offered a one-year extension. The 31-year-old, who has been at the club since 2011, wants a two-year deal and looks likely to leave unless Celtic come back with a better offer. Bolton, Wigan and Leicester are believed to be monitoring the situation closely and could make a move for him in January. Commons told BBC Scotland on Thursday that he wants to stay at Celtic. "I feel I've got a lot to offer and hopefully in these next couple of years I can do that," he said after scoring in the 4-3 Europa League Group D defeat by Dinamo Zagreb in Croatia. And, asked if he would still be at Celtic for the first leg of Celtic's Europa League last 32 tie on 19 February, he replied: "I sure hope so. That's the plan. "I am not involved in the talks and no doubt the manager's not - that's why you have football agents and that's why you have chief executives. "It is up to them to rustle up a deal that suits both parties and, at the minute, we're close but not close enough." "It is a terrific place to be when you are going to be in all the competitions and are going to win cups and leagues." Negotiations over a new deal for the former Stoke City, Nottingham Forest and Derby County player have dragged on for some months. Commons, who was born in England but was capped 12 times for Scotland, gave up international football in May 2013, saying he hoped it would prolong his Celtic career. "I would be very keen to stay," he stressed. "It is a terrific place to be when you are going to be in all the competitions and are going to win cups and leagues. "I will be looking forward to the Europa League draw and, fingers crossed, it will be a good tie." Commons has been out of the first-team starting line-up in recent weeks, but even a full 90 minutes and a goal was little compensation for defeat in Celtic's final game in a group in which were already guaranteed the runners-up spot. "If we play like that in the next round, we will be found wanting," he admitted. "On any given night, you are relying on your best players to turn up and your goalkeeper to pull off some saves and tonight our best players didn't turn up and Craig Gordon couldn't get to the goals." Stefan Scepovic scored on his return to Celtic's front line in the absence of John Guidetti, the on-loan Manchester City striker being ineligible for the group stage. The Serb stressed that the team's success was more important and that he was happy to bide his time to make an impact. "Even when you score, the most important thing is the three points, so it is disappointing that they scored two goals early in the second half and we could not come back from that," he said. "When you get the chance, you need to prove yourself, but it is the decision of the manager and you need to be ready when you are on the pitch."